PRODUCT : COPIC SKETCH SET - 72 COLOURS - SET B. The Copic Sketch marker is the ideal tool for sketching and scribbling - perfect for designers, graphic artists and manga artists. The sketch has two standard tips: Medium Broad and Super Brush. It is particularly suitable for colouring drawings, photocopies and laser prints since the ink is alcohol-based and dries quickly. With the uncoloured blender, colour blends are created or colours are lightened. Packaged in a clear plastic case, a Sketch set is the ideal way to begin or add to a marker collection. This set contains the following colours. E39, E40, E41, E43, E51, E57, C0, C2, C4, C6, C8, C10, N1, N3, N5, N7, N9, 0, BG49, B00, B02, B12, B18, B21, B24, B41, B45, E00, E02, E04, E07, E11, E13, E21, E31, E35, Y17, YG07, YG11, YG17, YG41, YG67, G00, G02, G05, G12, G14, G29, G85, BG02, BG11, BG13, BG32, BG45, BV00, BV04, BV23, BV31, V12, V15, V17, RV06, RV21, RV34, R20, R24, R29, R39, R59, YR02, Y00, Y08. ABOUT US : Bargainartistshop is the online sales name of The Paper House, Stafford. Established in 1984, we aim to offer premium brands at bargain prices. All our products are new and unused. We operate from our own modern site with a showroom and 9000 square foot warehouse. It is located five minutes from M6, jct 14. We can be contacted by telephone on 01785 212953. This does not include weekends and bank holidays. This time may increase during the run up to Christmas and during other busy periods. DELIVERIES NOT RECEIVED : If your order has been despatched but has not arrived in the time stated, we request that you check with your local sorting office. Our statatistics show that 95% of missing parcels turn up this way! 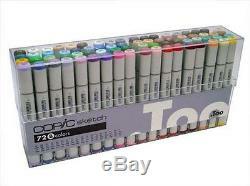 The item "Copic Sketch Marker Set 72 Pens Set B" is in sale since Monday, February 18, 2013. This item is in the category "Crafts\Painting, Drawing & Art\Drawing Supplies\Pens & Markers".